There seems to be news every day of more and more people experiencing hardships in their lives. There are stories of loved ones that didn’t return home. There are stories of weather disasters wiping out cities. There are stories of our young people and teenagers struggling. There are stories of corrupt politics; a crippling economy, job layoffs and firings, and more. You name it and it’s out there. The daily news is littered with the truth of the sorrow that can penetrate into anyone’s life on any given day; stories that cause one to just shake their head and feel the pang of sympathy for those going through. Nobody wants to experience hardships and nobody wants to see anybody else having to suffer with it either. Going through the hardships and the disappointments of life are hard enough, but when we start attributing the human characteristics of short-comings to a divine God, we rob ourselves of an unfailing assurance. It’s hard to keep one’s head above water during times of crisis. It is at that time when we need our safety float the most. Then is when we need to remember that God has never failed and He is not about to start failing today. 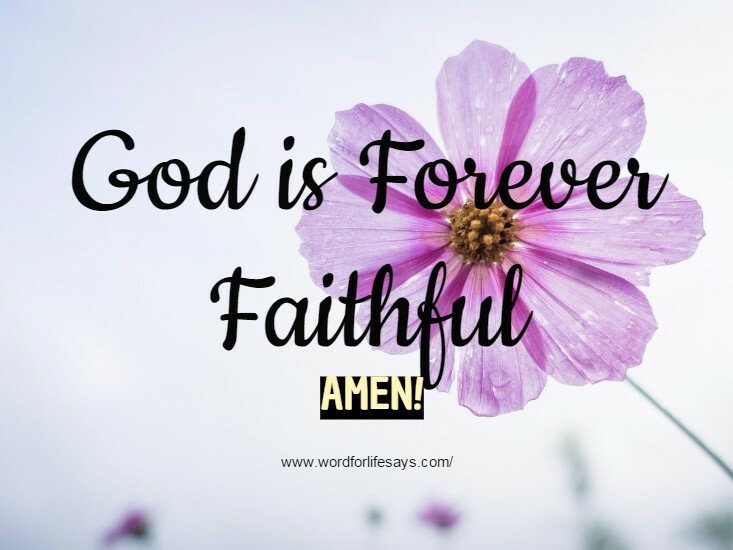 He is forever faithful! Even in the book of Lamentations after the people went into captivity and Jerusalem became desolate, Jeremiah penned words that still inspire to this generation. They became words that have resonated God’s faithfulness in song; words that recognize that God is still there with His people. Don’t measure God faithfulness by your present circumstances. God never promised the absence of hardship or adversity in our Christian walk. But, what He did promise, in His faithfulness, to be in it all the way with you (Matthew 28:20). Therefore, “Let us hold fast the profession of our faith without wavering; (for he is faithful that promised),” Hebrews 10:23. The pathway we have walked may not have been all peaches and cream, but God was there with us and brought us through to this day because He is faithful.